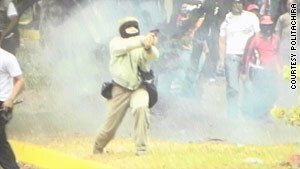 A state police photo appears to show a masked man firing a handgun Tuesday at unarmed demonstrators. Police response: "Those are baseless statements"
(CNN) -- Mourners in the western Venezuelan state of Tachira on Wednesday laid to rest the body of a university student who was shot dead at a protest while unarmed police looked on. The killing of Jesus Eduardo Ramirez Bello, 19, brought to the forefront long-running tensions between the federal government of President Hugo Chavez and opposition governors, including the governor of Tachira. Almost immediately after Tuesday's shooting, Minister for the Interior and Justice Tareck El Aissami blasted the police and opposition government of Tachira for failing to avoid the bloodshed. "What there is no doubt about is that the police of Tachira state and under the authority of the irresponsible governor of that state used improper procedures that resulted in the unfortunate casualty of one dead student," El Aissami said in a statement. A Tachira police spokesman defended the department, saying that the federal government had left them without arms. The national government is "saying that we were responsible, which is completely false," spokesman Ignacio Bolivar told CNN. "Those are baseless statements." The governor of Tachira is Cesar Perez Vivas, an opposition governor who unseated the previous pro-Chavez governor last year. Venezuelan governors and mayors not aligned with Chavez have complained publicly in recent months that the federal government has targeted them and their services. According to the National Experimental University of Tachira (UNET), students were protesting a reduction in the school's budget, and failures in infrastructure that were affecting electricity and other public services. Tuesday's protest was also a response to an incident last week at another area university, where student protesters were shot at, injuring one. Students from a nearby state-run university faced off with the UNET students, and over the course of several hours the protest denigrated into a shouting match, and rocks and other projectiles were thrown, Bolivar said. Non-student supporters of Chavez also joined the counter-protest, and one of those men is suspected of shooting into the crowd of protesters, Bolivar said. Ramirez, a first-year mechanical engineering student, was shot in the head and died en route to the hospital. "The whole town is mourning today," said Jose Luis Rivas, a law student involved with the opposition. UNET planned a march for peace Thursday in response to Ramirez's death. The reasons behind the student protests are not localized to Tachira. Infrastructure problems across the country in recent months have led to water rationing and rolling blackouts in many areas. Rivas, 20, who grew up in Tachira, said conditions have gotten worse. Though Venezuela is a major oil-producing country, gasoline shortages have become common, Rivas said. It was not unusual to wait more than 30 minutes to fill up a car, he said. Chavez's supporters, both students and others, have been known to defend their president with violence, as police suspect was the case in Ramirez's killing. "There is a general discontent, but the people don't have a way to respond to it," Rivas said. Chavez's government rallied around the student's death, decrying a lack of action by the Tachira state police. "The Tachira police had an imperative to act," El Aissami said, according to the official Bolivarian News Agency. "According to the law, they have to safeguard the peace. They have the right to use gradual force. They don't have to retreat from the place. There is an act of negligence that compromises the police in the case." But Bolivar, the police spokesman, said the state police had no weapons because federal officials had taken them. The military disarmed the police ostensibly because their weapons lacked an official government seal. More than 2,000 guns were taken from the Tachira police in October and have not been returned, Bolivar said. The officers at the protest "approached basically to persuade them with only a shield and bulletproof vest," he said. "The police never abandoned its position until they had to retreat, because they were in the firing line." The Chavez government will thoroughly investigate the case, El Aissami said. The national government has asked the state police for their uniforms, to test them for gunpowder residue to see whether they fired a weapon, Bolivar said. The fallout from Ramirez's shooting death appears likely to become fodder for both sides of the political spectrum. The Chavez government says the opposition is uncooperative and incompetent, and the opposition says Chavez is out to get them.